Declan Gibbons reports that fishing has been relatively quiet on Corrib, however there is some spectacular sport still to be had with "Corrib still giving" according to Larry McCarthy of Corrib View Lodge (087-9135222, www.corribangling.com ). Larry and Michelle hosted two first time visitors to Corrib View Lodge - Tony Ling and Tony Donnelly - who had spectacular fishing last week over 4 days. Monday's early morning Caenis rise produced 2 trout including one over 3lbs. Wind on Tuesday had the duo sedge fishing which saw them catch 4 trout, one of which was 4lbs 10 oz. Wednesday saw 2 trout being caught up to 3lbs. On Thursday Corrib was kind to the visiting anglers which saw Tony Ling catch a personal best of 5lbs 10oz whilst Caenis fishing with Larry. All trout were weighed and sportingly released. Jeremy O'Brien also had two red letter mornings while guided by Larry, catching 8 beautiful trout on Monday, 3 of which were over 4lbs. On Wednesday Jeremy had 8 trout all all between the 2 and 3lbs mark with all sportingly released. Finally Bill Lytham, an angling guide in the UK, had 10 good trout over three mornings; all fish were between 1lb 8oz and 3lbs 8oz and all were sportingly released. Bill also enjoyed an evening's fishing guided by Larry on the excellent Clare River with a river beauty of 2lbs 12oz. 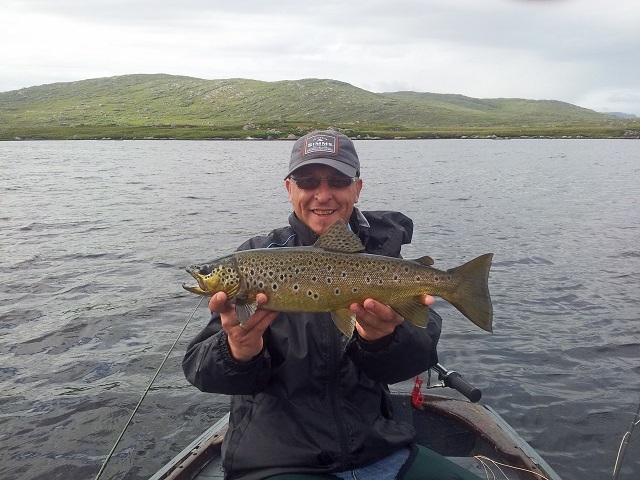 UK angler Tony Ling with a fantastic 5 lbs 10z trout taken on a Caenis pattern on Lough Corrib. On Sunday Kilbeg & District Anglers Club hosted the Thomas Creaven Cup. It was a mixed grill competition run on a catch -and-release basis. In first place was lady angler Anna Lee Foster who caught 2 trout for 1880 points. Second place was shared between Paul Miller and Gerry McCranor with 940 points. Third place was Emmet Greaney with 880 points. Fursey Kenny was in fourth place with 830 points and in fifth place was Paul White with 723.5 points. All funds raised from this competition went towards the local national school which is Clydagh NS. A fun day was had by 25 anglers in which 10 anglers landed fish. Prize giving and BBQ took place at Murphys Bar, Kilbeg Pier where a fun evening was had by all. Reports from Connemara are sparse this week, as low water levels over the last week were superseded by heavy rain on Tuesday, following which rivers hve been in flood. As the floods clear salmon and sea trout are starting to move in better numbers, and I expect to have much more to report next week with these better conditions now promising good fishing for the next few days. Among the fisheries expected to fare well are Costello and Fermoyle, where the numbers caught have been ahead of previous years so far. Contact Terry Gallagher at terrygal7@gmail.com or on 087 2399988 to book fishing. Lough Inagh should also feature well, with the lake now at a good level for fishing and releasing plenty of water to the river downstream. Colin Folan is the man to contact there, email colfolan@gmail.com or call the hotel at 095 34706. Downstream of Inagh, the Ballynahinch Castle beats will be seeing a lot of fish running on the fresh water and should produce good sport to the rod over the coming weeks. Contact the castle at 095 31006 for enquiries. I was at Aasleagh Lodge on the River Erriff on Monday, which is looking well at the moment under new management, who are very welcoming to anglers. The river got a nice flood of 1.8m following Tuesday's heavy rain, which has been topped up by showers since, keeping the river at a good fishing level. Salmon and sea trout are running the river here too, and the upper beats will be fishing well once the influx of fresh fish have settled into their lies. Osgur Grive is the new fishery manager here and can be contacted at 095 42382, or email erriff.fishery@gmail.com . Screebe fishery manager Trevor Down with a fine trout from the middle lake at Screebe.